Joel Chan’s (陳山聰) image took a steep dive when he abandoned his wife and career for heiress Florinda Ho (何超雲) in 2011. 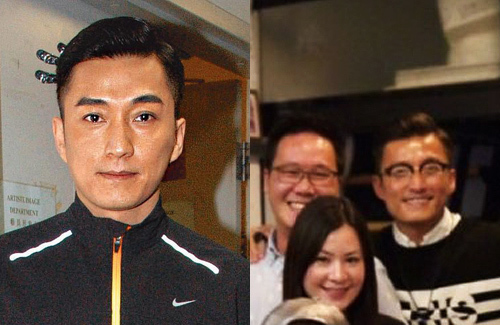 While dating Florinda, Joel briefly left TVB but returned to acting after their relationship ended in 2013. Hoping not to be scrutinized in his current relationship with businesswoman Apple, Joel hopes to handle the romance in a low-profile manner. Is it Betty Or Apple?? Correct the article looks like crossed over the name ms.
@ricky721 that’s what i thought so…one minute Apple, next Betty. she is a businessWOMAN. Always liked Joel. Seems a changed man for the better! Always like Joel as an actor. He is lucky he js a guy as if he was a girl his past action could have ruin his career already. I agree and feel that Joel is just very lucky. He seems to be more compatible with older women rather than younger women. In more traditional societies, men are always at more of an advantage than women. My parents said they would allow me to marry a guy that has been married with children but would never allow my brothers to marry a women that has been previously married or has had children. That’s traditional folks for you. @hetieshou Haha. Agree with you soooo much. A male divorcee, people will still say he has changed for better and still has charm. A female divorcee with kids is a mother with kids without husband. Marrying a mother with kids is stupid. I wonder when all these stigma will be gone. Btw, changed man or not, still can’t get over that he abandon his ex wife to be with some one younger and richer. If a wife did the same thing with other man, you think tvb will take her back??? Which shoes he polished to be back…. @hetieshou your parents…..very traditional…..kinds backward in thinking I gotta say. As my parents sre pretty traditional too but have bend a lot as they grow older. I think Joel did all the right things afterwards. He took a break from the entertainment circle and worked a proper job instead of going back to TVB to beg for roles. He became modest and stayed away from the spotlight. He said all the right things in his interviews and also started his running group. Whether this is an act or not, it gives of a good fresh image which allows the public and media to forgive him. Edison didn’t get another chance.In contrast Shirley Yeung cheated and got pregnant, then lied that she was pregnant. Afterwards she kept trying to shift the blame and the stories didnt add up but still the public sympathised with her and TVB didnt sack her. @jimmyszeto well…. Can’t really compare edison scandal to anything as his was pretty drastic!!! Shirley got people sympathy and wasn’t sack by tvb but she also didnt get much job after what happen. Look at Joel he came back as got some meaty roles already. I just think Joel made a patient effort to improve his image. Others either didn’t or couldn’t. Although he isn’t young, he is potentially ‘lead actor’ material. @jimmyszeto he does. I like him as an actor as he is pretty versatile imo. But I still think he is lucky to quit acting like that come back and have such good roles. I would much prefer to watch Joel Chan…. It’s better to see them as potential spouses than as potential ATM’s. LOL!! Hard to take a businesswoman with a name like Apple seriously. Unless she works at Apple. Like I had said in a previous post, if Hong Kong people want to follow the English tradition properly; at least show some respect and use proper English names. Not stupid names such as Apple, Coffee, Mango, Angelababy etr. Just makes it look obvious that their English language is poor. Angelababy – meet BabyJohn, a new HK actor with an equally dopey name. There’s certainly no shortage of TVB actors/actresses with lame names on this site. Unless your parents are Chris Martin and Gwyneth Paltrow, then you’d have no choice. LOL!! Seriously, I think Apple Martin must be looking forward to her bat mitzvah when she can get a proper middle name which she can go by in place of the fruity name. Something rabbincal like Rebekah, Sara, or Deborah. All da best Joel! A good actor for sure!